Mark Rylance is out to make his mark as one of the greats, a Kean, a Garrick, a Booth, but he is also trying to be something more. He is both acting and exfoliating. 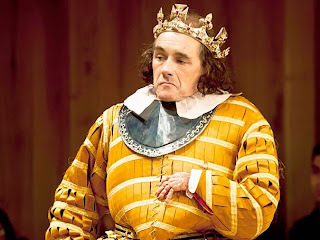 In the Shakespeare's Globe production of Richard III, currently playing in repertoire with Twelfth Night at the Belasco the audience is allowed to come early and see the actors getting dressed and in the course of the play, Rylance himself steps in and out of his role, seemingly at will. During one recent performance an audience member sitting in the Elizabethan Gallery, built on stage, literally collapsed and fell out of her seat. Rylance played the moment with consummate tact, rejoining with “as I was saying,” when it became apparent that she was alright. We’ve recently had the all female Donmar Warehouse production of Julius Caesar at St Ann’s Warehouse. This Richard III is all male, which is the way it was originally done in Elizabethan times, with one exception. The Elizabethans weren’t drag queens. Here we have Richard’s mother as a mammy with an oversized rear end. Richard’s wife Ann looks like a character out of the Addams Family. This production could have been called The Comedy of Richard III and staged by Charles Ludlam and his Ridiculous Theatrical Company, were Ludlam still alive. And while it gives Rylance the opportunity to exhibit the full range of his comic skills including those of a master of ceremonies, a ham, stand up comedian and sometime Uriah Heap, it sometimes detracts from the tragedy. It is only in the final act that Tim Carroll, who directed, really tackles the question of the self-abnegation which has created a tyrant and monster. One sometimes forgets that Shakespeare created a character who hated himself, almost as much as he was despised. You have to take a breathe but by the end, in a fourth down drive, Rylance settles back in his character and gives us back the Richard, we have always known and despised— in his all his horror.